Ar-Rahnu X’Change is a franchise which offers Islamic pawn broking services (Ar-Rahnu) under Bank Rakyat. First launched in 7 December 2006, today it has 114 outlets nationwide. Ar-Rahnu X’Change (ARX Change) offers quick cash micro credit facility collateralized by gold or gold jewellery for up to RM650,000 through either the Ar-Rahnu, Az-Zahab or Az-Zahab Premium schemes. Aside from financing facilities, Ar-Rahnu X’Change also offers ARX Storage, a jewellery storage service with maximum insurance security, as well as jewellery cleaning services. 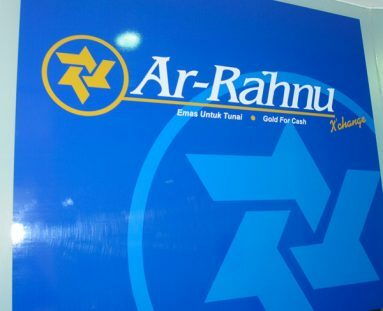 Ar-Rahnu X’Change operates based on Bank Rakyat’s experience and expertise in Ar-Rahnu business since 1993. Through the franchise system, Bank Rakyat offers cooperatives the ability and rights as a franchisee to manage business operations of its Ar-Rahnu business. Rakyat Management Services Sdn Bhd, a subsidiary of Bank Rakyat, holds the rights and responsibilities as franchisor of the Ar-Rahnu X’Change franchise and oversees all business operations.